Bletchley Urban District Council had its answer all ready to the plans for a new city in North Bucks: WE CAN TAKE IT. The Council had previously responded to the 1952 Town Development Act for the expansion of the southeast, more specifically the overspill from London, by planning and building hundreds of houses: ‘if you can find a job, we will provide a house’. By 1964, the size of Bletchley had doubled, and the Council was waiting for the Ministry of Housing to give permission for further expansion. By January 1964, North Bucks County had come up with its own plan, known eventually as Pooleyville. Based on a monorail system of transport that stretched itself in four separate wings around a central point, it envisaged residential estates housing 350,000 people grouped around the monorail stations. 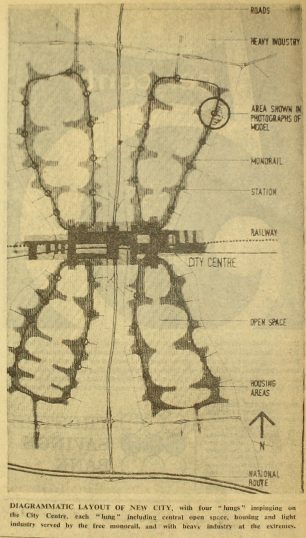 Each wing would enclose open areas for public buildings: schools; hospital; open space; light industry; shopping etc., while heavy industry would be accommodated outside the system. Pooleyville did not include Bletchley specifically in its plan, but would be based on Loughton. In response, the Council produced its own plan:The Engle. 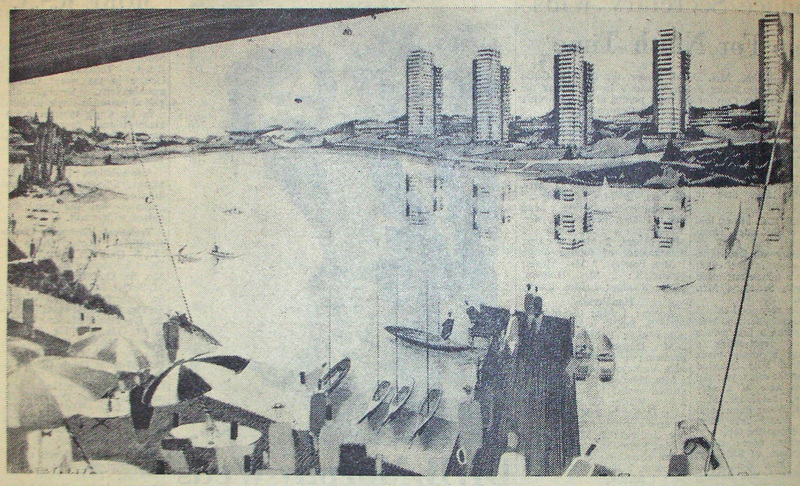 Mr Engle’s idea was to incorporate the clay pits southwest of the town into a marina with high residential units around it, a civic centre and costing £195m. It revived the notion of a Bigger, Better, Brighter Bletchley and would provide housing for a population of 150,000. In 1965, neither plan was recognised: the Ministry decided on a new town eventually incorporating many small existing villages and Wolverton, Stony Stratford, and Bletchley into Milton Keynes.